Gaël Giraud SJ is the Chief Economist and Executive Director of the Research and Knowledge Directorate of the Agence Française de Développement. 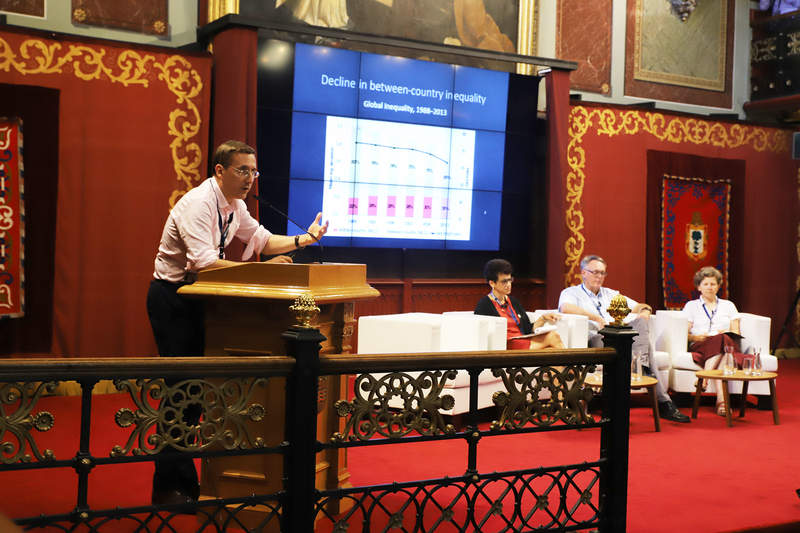 His lecture, which provided abundant data, charts and graphics was entitled “Economic Inequality and Environmental Degradation and the Role of the Jesuit University”. He began by saying that, even if at first sight it might seem that inequality has decreased in the world in the last decades, this is only a superficial view: it is actually a decrease in inequality between countries, due to the success of nations like China in getting people out of poverty. However, inequality on the world scale is on the rise. A huge amount of the world’s wealth is in the hands of a few, and “this explosion of inequality that we are witnessing today is one of the biggest threats to social cohesion”. Related to this, we find the problem of education, even in western countries: for the first time in history, parents in a number of countries are seeing that it will be more difficult for their children to receive higher education than it was for them. In poor countries the problem is, of course, far worse. In some African countries, children attend school but do not learn anything valuable, either due to lack of teachers or because there is nothing to teach. He also analysed the issue of greenhouse emissions and global warming. He warned that 70% of the world’s population could suffer from deadly heat waves 20 days a year by the end of the century. Not to mention floods, the rise in sea levels, the erosion of the biodiversity, etc. The challenge for coming generations is to find a way to organize their societies so that they will have a low ecological footprint and a high level of human development at the same time. To achieve that goal, everyone will have to move: poor countries need to increase their human development levels, and rich countries need to reduce their ecological footprint. “It is impossible for us to continue on the same ‘business as usual path‘. In the face of this, Giraud quoted Pope Francis’s words: “Halfway measures simply delay the inevitable disaster”. Put simply, it is a matter of redefining our notion of progress. His address was not a mere analysis of the state of the world. Giraud sprinkled his speech with provocative questions for the 300 leaders of Jesuit universities gathered in the hall: “Is our teaching consistent with conservation of natural resources?”, “Is my campus sustainable?”, “What does excellence mean for our universities?”, “Is our universities’ business model increasing or reducing inequality?”, etc. It was an invitation to critically asses what we teach and what we leave, and to wonder whether we are living what we teach and teaching what we live.